Don't let dental flaws keep you from sharing your smile. Dental bonding alone, or combined with general dentistry, can correct a variety of dental imperfections to reveal a stunning smile. To learn more about the use of dental bonding, we offer this overview from Charlotte dentist Charles A. Porter. Dental bonding is a quick, painless cosmetic dentistry treatment used to correct dental flaws and imperfections. During dental bonding treatment, a putty-like resin is applied to the teeth. 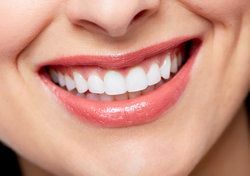 This resin is shaded to match the surrounding teeth or it can be made a brighter white to improve overall dental color. While the resin is still malleable, it is shaped to the desired size and appearance. Once the desired appearance is achieved, the resin is cured, or hardened, with a special light. After the curing process, the bonded teeth are finely shaped and polished to complete treatment. In most cases, treatment can be completed in a single dental visit but may require additional visits depending on the needs of the patient. What Are the Uses of Dental Bonding? Misshaped teeth: Jagged, pointed, or otherwise misshaped teeth can be reshaped with dental bonding treatment. Oversized or undersized teeth: When teeth are too large or too small, it can make the smile look disproportioned and cause embarrassment. With dental bonding, the teeth can be adjusted to any size. Deep stains: For some people with deep stains, even professional whitening treatments are not strong enough to restore dental brightness. Fortunately, dental bonding can be made in any shade of white to brighten the most deeply stained teeth. Minor fractures or chips: Small chips or fractures can be repaired with dental bonding, restoring the appearance of the teeth and preventing further damage. Minor decay: Minor cavities can be treated with dental bonding, preventing the embarrassment of noticeable metal fillings. Gaps between teeth: Gaps between teeth can be quickly and easily closed with dental bonding treatment. Dental bonding can improve the appearance of a number of dental issues, however, it is not suitable for all patients. Candidates for dental bonding should have generally healthy teeth and gums. Though dental bonding is used to treat decay and fractures, these types of damage must be minor. For more extensive decay or damage, alternative restorative dentistry treatments are available. Some alternative treatments include porcelain veneers, inlays and onlays, and dental crowns. Find Out if Dental Bonding Is Right for You! If the appearance of your teeth has left you feeling embarrassed, dental bonding may be the right treatment for you. Dental bonding can mask many dental issues, restoring the appearance of your smile and improving confidence. To find out if dental bonding is right for you, we welcome you to schedule a consultation with Dr. Potter today!